Noddy’s Beds are dedicated to providing you with the perfect night’s sleep – every night. We deliver high quality mattresses and bed bases at discounted prices from our Altona outlet store. We store an extensive range covering all sizes and varieties including single, king size single, double, queen and king size beds. We are proud providers of Melbourne’s best range of mattresses and bed bases that won’t break the bank. You’ll be resting comfortably with the knowledge that your brand-new bed didn’t cost you a fortune – that’s the Noddy’s guarantee. We are able to deliver our beds throughout Melbourne and Sydney. We have a great selection of mattresses that are perfectly suited to a range of different sleep requirements. 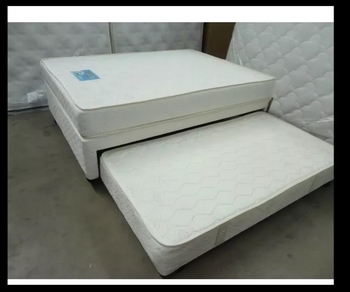 In our extensive collection we sell memory foam mattresses, pocket spring mattresses, innerspring mattresses, pillowtop mattresses and base beds that comes either with or without draws. Noddy’s Beds have whatever style you are looking for, and at great prices, check out our extensive range at our online store or feel free to come into our Altona outlet to see our extensive range in person. We guarantee that we only select the highest quality mattresses available at our store. When you select a bed from Noddy’s for getting your good night’s sleep, you can rest assured that the mattress is of a superior, durable quality. Have any enquiries about our product range? Or do you have a particular product in mind and want to discuss its specifications? Then feel free to get in contact with the friendly team of staff at Noddy’s Beds. We are dedicated to providing an exceptional level of customer service and are happy to assist you with any enquiries you may have. Call us on 0434 540 290 or send us a message via our contact page and we will get back to you as soon as possible and with all the information you require regarding the bed you have in mind.